Adult Swim's sci-fi show has never been so painfully self-aware. Adult Swim’s Rick and Morty has been a meta show since the very beginning, with its protagonist Rick Sanchez often breaking the fourth wall to comment on the show itself, but in Season 3, the villain isn’t a swarm of Meeseeks or Evil Morty, it’s the fans. The first two seasons thrived in poking fun at classic sci-fi storytelling tropes, teasing out Rick and Morty versions of stories about everything from love potions to Inception-style dream adventures. But as the third season continues, Rick and Morty satirizes more than just the hypermasculine violence of Mad Max and the formulaic oversaturation of superhero stories. Rick and Morty is trolling you, the fans, and commenting on your insatiable obsession with the show at every joke and plot twist, fueling your insane fan theories before undermining them in the next punchline. Why? Probably because for the better part of two years, fans harassed the creators via Twitter. As Season 3 grapples with the inner psychology of Rick and Morty’s characters — Rick’s alcoholism, Morty’s anger, Summer’s body image issues, Beth’s need for validation, and Jerry’s utter ineptitude — the show itself offers meta commentary on our obsession with it. Rick nurses a hangover and grows annoyed with the Vindicators. During a live-stream event held in late June that debuted the Season 3 trailer, the creators discussed their difficulties in producing Season 3, and it had a lot to do with pressures from fans. The thing is: These people have been listening to fans this whole time, hearing their concerns, wishes, and frustrations. As Rick and Morty’s success ballooned during its post-Season 2 hiatus, hype for the third season exploded with the surprise premiere on April 1, kicking off a series of episodes more meta than usual, oftentimes commenting on fans’ obsession whether or not we realized it. Rick and Morty is a thoughtful show that inspires zeal in fans, just not always the kind that its creators want to deal with. That’s why the stories themselves take a stab at us sometimes. Harmon and Roiland have gone on record saying that they don’t really pay attention to fan theories, but it’s hard to not see a bit of a self-aware jab when, in the Season 3 premiere, they teased an origin story for Rick that killed off his wife and daughter. Finally, fans could explain what caused Rick to become an alcoholic nihilist! But in a brilliant twist, it was all a farce. The false memory created by Rick tricked the Galactic Federation just as the show itself tricked the sort of viewer that writes fan fiction about Rick’s presumably dead wife. Much like Morty, fans want to derive meaning and purpose from Rick and Morty’s infinite universe, but this season, if Harmon and Roiland are telling us anything, it’s that none of us will never find it. Much like Morty, we just have to embrace the meaninglessness of existence. There’s never been anything more absurd and virtually meaningless than that one time Rick turned himself into a pickle and got himself into a serious metaphorical pickle just to avoid going to therapy. “Pickle Rick” represents Rick and Morty pushing the boundaries of insanity and violence that we’re capable of watching, yet fans reacted with something bordering worship. Simmering in the background of this survivalist story is Rick’s egocentric indictment of therapy itself. Dr. Wong rightfully assesses that Rick would be “bored senseless with therapy,” because it’s mundane work with very little risk. Morty and Summer want to continue therapy, but their parental units would rather cover up their psychological issues with more alcohol. Why is this a person we, and characters on the show, idolize? It’s fucked up, but it’s exactly the kind of escapism we ourselves engage in when we watch a show like Rick and Morty. The creators seem to know this even if the fans seldom acknowledge it. “Vindicators 3: The Return of Worldender” furthered this critique with a team of galactic superheroes that brutally satirized the superhero genre. It also made Rick a Jigsaw-style maniacal villain. We’re forced to reevaluate, as fans, how much we can worship Rick when he goes to such great lengths to humiliate and kill these heroes, even if they’re all revealed as morally bankrupt egoists. Rick and Morty has always focused on Morty, Summer, and Beth worshipping Rick despite his mistreatment of them. We too worship the mad scientist for his brilliance by projecting a more sensitive persona onto Rick that’s buried beneath the veneer of arrogance and alcoholism. “Vindicators 3” takes Rick’s mistreatment of Morty to the breaking point, teasing an outright confession of love for his grandson, but it never happens. 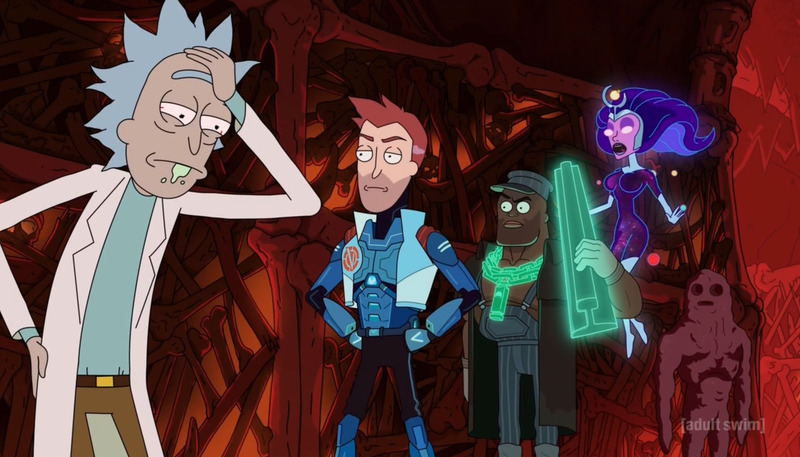 It’s a titillating moment for fans, hilariously undone when we find out that Blackout Rick had a soft spot for Noob-Noob and not Morty. The whole thing reeks of the sentiment to “never meet your heroes.” Even in an episode with literal heroes, death is everywhere and everything is meaningless anyway. Yet again, why does anybody even like Rick? Maybe Harmon and Roiland want us to stop looking for that meaning. When Morty tells Summer, “Nobody exists on purpose. Nobody belongs anywhere. We’re all going to die. Come watch TV,” we ought to take that advice. Ultimately, the villain of Rick and Morty Season 3 is you.